Hindi Lyrics 4 U: Lyrics Of "Ae Raaju" From Latest Album - Ae Raju (2016). Lyrics Of "Ae Raaju" From Latest Album - Ae Raju (2016). 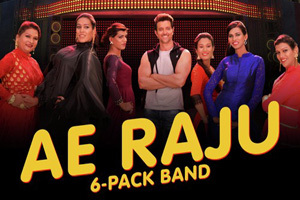 Masti bhara song sung by 6 Pack Band featuring them and Hrithik Roshan in song video. The video of this song is available on YouTube at the official channel YFilms. This video is of 4 minutes 19 seconds duration. Lyrics in Hindi (Unicode) of "ऐ राजू"